Alfalfa requires high phosphorus (P) and potassium (K) soil fertility and has a high demand for these nutrients. Alfalfa can benefit from the micronutrients in manure, particularly boron. 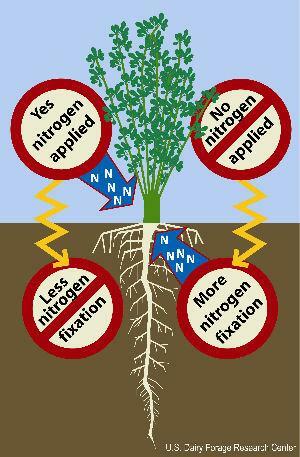 Alfalfa removes large amounts of nitrogen (N) and K from the field when harvested as hay. Alfalfa has the ability to draw down nitrate levels within its root zone. Forages like alfalfa have low erosion, nutrient runoff and nutrient leaching potential. Alfalfa offers opportunities for manure application throughout the year. Poorly timed applications can damage the alfalfa stand through physical damage to plants. Manure applications can increase weed competition particularly in mixed grass-alfalfa stands. Alfalfa is a legume so has no requirement for applied N limiting manure nutrient value. Manure can be an unbalanced fertilizer (ie. does not exactly match crop needs for all nutrients) so applying manure based on N often results in the build up of excess P and K in the soil. Manure applications at the end of stand life can result in soil N supply in excess of the following crop needs potentially increasing N losses to water and the atmosphere. Alfalfa is predominantly grown in alfalfa-corn rotations associated with dairy production. The alfalfa stand can last five years or more and then the field is rotated to corn for two to three years before returning to alfalfa. In these systems the crop rotation has the dual role of utilizing the fertilizer value of manure and providing a place to apply manure to prevent overflow of manure storage facilities. One challenging characteristic of alfalfa-corn rotations is the relatively low demand for external inputs of N. Alfalfa, as a legume crop, fixes the N it needs and typically requires no N applications to maximize yield. Residual benefits from the N fixed by alfalfa will provide most of the N needed by first-year corn following alfalfa and frequently reduce N needs in the second-year crop following alfalfa. See state-specific recommendations on the N value of an alfalfa stand to the subsequent crop. In most states the only significant fertilizer N need in alfalfa-corn rotations is on second- and third-year corn following alfalfa. The best opportunity to maximize the value of manure in alfalfa-corn rotations is to apply manure to second- and third-year corn following alfalfa to at rates that meet N needs of corn. In this system all the N, P and K fertilizer value will be realized. Manure eliminates the need to purchase N, P and K fertilizer for corn and any excess P and K reduces fertilizer need of the following alfalfa crop. Manure on established alfalfa can increase yields. 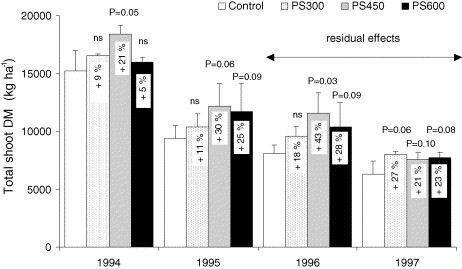 In this study, swine slurry (4.5% dry matter) was surface-applied to alfalfa at four rates (0, 300, 450 and 600 kg/ha/year) in 1994 and 1995. Manure was applied four times per year typically a few days after cutting. Alfalfa yield was increased in the years of application and the two years following application. Reference: Ceotto, E and P. Spallacci. 2006. Pig slurry applications to alfalfa: Productivity, solar radiation utilization, N and P removal. Field Crops Res. 95:135-155. Farmers benefit from maximizing manure applications to this portion of the rotation but there are limitations. The optimal timing of application is limited to a relatively short period in spring prior to planting and early in crop growth. There also typically is not enough land in second- and third-year corn following alfalfa to utilize all manure produced by the farm. Consequently dairy farmers frequently are looking for opportunities to apply manure on the alfalfa phase of alfalfa-corn rotations. However, this can result in a steady buildup of P and K in the soil. Repeated applications of manure to meet both the nitrogen need of corn and the nitrogen removal capacity of alfalfa can excessively raise soil test P and K levels. Use nutrient management planning to balance manure application rates with rotation P and K needs. Manure on second- or third-year corn following alfalfa has the added benefit that the crop needs N. Figure from D. Beegle, The Pennsylvania State University. A prerequisite to making smart decisions about applying manure on alfalfa requires an understanding of the impact of applied N on alfalfa stands. Alfalfa has the capacity to fix N from the atmosphere to meet its needs. Each ton of harvested alfalfa can contain 50 pounds of N and in low N-supply soils most of this N will be derived from N fixation. Total N fixation can reach hundreds of pounds of N per acre per year. There is an energy benefit to the alfalfa plant to use N from the soil in preference to fixing N from the atmosphere. Alfalfa plants that have access to alternative N supplies will reduce N fixation and preferentially use the alternative N supply. This buffering process means manure applications that meet alfalfa N need will not lead to over-application of N. Such applications are not economically beneficial because there is no yield value to the applied N. But there is no water quality cost from applying this N even though the alfalfa does not need it. Application to established productive stands. Post production applications prior to destroying the stand. The first two strategies can be conditionally recommended as long as farmers are aware of the limitations and challenges of manure applications during these periods of alfalfa production. The final strategy, post production applications, cannot be recommended because manure applied at this time is likely to lead to potential increases in N loss. Preplant manure applications for alfalfa can meet P and K requirements of manure for the first years of production. The application rate is limited by the lower yield and N demand during alfalfa establishment. Care must be taken insure that the seed is not in direct contact with fresh manure through injection or incorporation of manure. The N in the manure can promote weed competition during establishment. It also can promote lodging of oats if oats are used as a nurse crop for establishing alfalfa. Manure applications to established stands can provide needed P, K and boron. Alfalfa also provides windows of opportunity for manure application through the whole growing season. High yielding alfalfa has a high capacity to buffer high amounts of manure N. The primary concern with manure applications to established alfalfa is damage to the stand from the manure. Alfalfa plants can be damaged by high salt or ammonia concentration in the manure, by physical damage to the crowns by manure application equipment or by water deficits induced by high salt concentrations in the manure. The greatest danger is from slurry or solid manure that is applied with large manure spreaders. Lagoon water from unagitated lagoons typically posses less risk because nutrient and salt concentrations are lower. Another concern is manure may increase competition from grass or weeds if they are present in the stand. Make sure application equipment breaks up large lumps of solid manure and applies manure in a uniform pattern on the field. Limit manure application rates. High rates increase potential for stand damage. Apply manure immediately after cutting alfalfa and before budding on the alfalfa crowns. The alfalfa plant is less vulnerable to salt damage when no green leaves are showing. This is particularly important for surface applications of slurry. When using manure that has a high potential to damage the stand apply to older stands that have a high grass or weed component. Mistakes with manure applications on these stands are less costly. Applications at or near the end of stand life cannot be recommended because they lead to applications that exceed N utilization capacity of the rotation. Farmers frequently want to apply manure to alfalfa in the fall just prior to killing the stand. Manure applications at this stage occur after alfalfa N demand. It is really an application that will supply the subsequent crop with N; typically there is limited need for added N in the crop following alfalfa. Under these conditions manure applications will easily lead to excess N in the soil profile. Such conditions promote N losses to water and air resources. 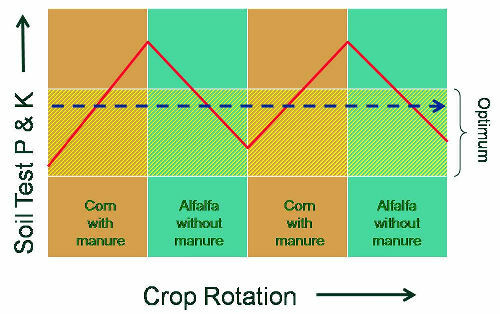 Applying manure to alfalfa: Pros, cons and recommendations for three application strategies 2003. K.A. Kelling and M.A. Schmidt. North Central Regional Research Report 346. Application of manure to established alfalfa 2006. Q.M. Ketterings, E. Frenay, J.H. Cherney, K. Czymmek, S.D. Klausner, L.E. Chase and Y. Schukken. Cornell University Cooperative Extension Agronomy Fact Sheet 16. 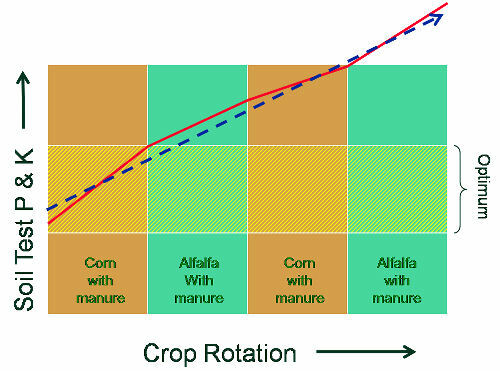 In alfalfa-corn rotations maximize manure value by applying to second- and third-year corn following alfalfa. Applications to established alfalfa stands are conditionally recommended to meet P, K and boron needs. Manure N will have no value but alfalfa can buffer applied N minimizing over application concerns. If manure is applied based on N need of the corn and N uptake by alfalfa, excess P and K buildup can be a problem. Therefore, try to balance P and K over the whole rotation. Steps need to be taken to minimize potential damage to established alfalfa stands particularly when applying slurry or solid manure.